Bret Lorimore, Chris Vlessis and George Harder won the Best Use of Outside Data at DataFest, a nationwide event. 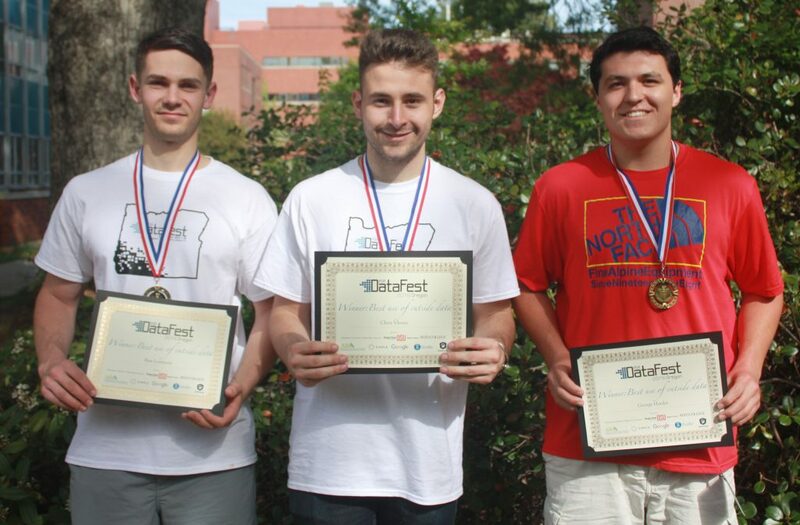 Computer science students Bret Lorimore, Chris Vlessis and George Harder took a big plunge into big data when they participated in DataFest, a nationwide hackathon-style event, in April. The group won the Best Use of Outside Data award in the American Statistical Association competition hosted at over 20 universities, including Oregon State University. DataFest is a competition that challenges students to analyze a complex data set over a single weekend. “We had nine teams with a total of 38 students from Oregon State, University of Oregon and Reed College, representing statistics, computer science, neuroscience, biophysics and biochemistry, business, math, and economics,” said Charlotte Wickham, an assistant professor of statistics at Oregon State and organizer of the event. Competitors didn’t have any access to the data ahead of time, nor did they know where the data would come from. This year, Ticketmaster provided data that included information about the company’s Google analytics, ad words, website user “click” data and ticket sales. Though participants were given millions of data points, the tasks they were given to accomplish were not highly defined. Students needed to decide for themselves what research question they wanted to answer and then worked to extract valuable information out of the data. “They wanted people to come up with information that Ticketmaster could use as an actionable item to improve their business,” said team member, Lorimore. Ultimately, the team chose to tackle the effectiveness of Ticketmaster’s advertisements. “We found Ticketmaster was wasting a lot of money on Google keywords,” Vlessis said. The trio discovered that people were clicking on the ads but not following through to purchase tickets and as a result, the company lost more than $1.4 million over the course of a year on ineffective advertising. Vlessis’s startup company, SteadyBudget, happens to solve the same types of problems presented at this year’s DataFest, so the team had access to additional data from advertising analysts. They looked at general trends of how SteadyBudget analysts interact with their advertisements and the decisions they make about placing or pulling ads. The group then used that information to help make advertising decisions for Ticketmaster. Although DataFest was about solving a data problem, it was not all about the numbers. “We spent a lot more time brainstorming and talking about what we wanted to do than sitting down and writing code,” Harder said. The group also gained an appreciation for the different ways people approached the data. “Seeing some of the techniques others used, and the way they went about approaching the problems and finding solutions, was stuff I never would have thought of,” Vlessis said.